Being the salt of the earth might be considered a good thing for people, but not for vegetation. Salt has a long history of being used to destroy unwanted vegetation. Unfortunately, if used incorrectly, it can also kill wanted vegetation. Before pulling out the salt shaker and heading outside, it is a good idea to understand what salt can do and how to use it correctly as a weed killer. In the ancient world, salt was much more valuable than it is today. In Roman times, salt was often used as currency and no good slaves were declared "not worth their salt." The idea that salt could destroy vegetation was also common knowledge: Salt was often sown into an enemy's field in order to make the land barren. Salt affects a plant in several ways. When it is present in the soil, a plant is unable to absorb enough water no matter how much water is available. 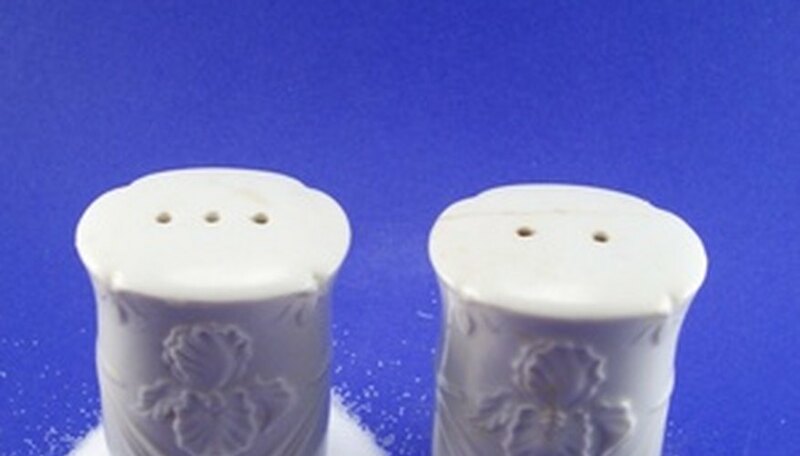 The salt also restricts a plants intake of essential nutrients. Eventually the plant dies because of dehydration, a process known as "physiological drought." Applying salt to the base of any plant will, if done in the right amount, eventually kill it. The trick is to apply it to the plant you want to kill and not to the more desirable plants. Therefore, salt is better used to kill weeds in areas without other vegetation: driveways, sidewalks and so forth. In this case, dissolve 1 cup of salt to 2 cups of boiling water. Then, spray the salt mixture onto the weeds. Another option is to take a pinch of salt and apply it to the base of the weed. Make sure to do this when rain is not in the forecast, or else the salt will be washed away before it kills. One of the biggest dangers of using salt as a weed killer is that the salt may accumulate in the soil. People who live in northern areas experience this problem quite frequently, not because they use salt to eliminate weeds, but because they use it eliminate ice on their roads. As a result, vegetation and trees often experience some dieback when the salt accumulates in the soil. The only way to avoid or minimize this problem is to flush the salt out of the soil. This can be done by Mother Nature with heavy rains or man with a frequent watering. If you decide to use salt as a weed killer, you may be confused about whether you should use rock salt, table salt or softener salt. If dissolving the salt in water, it will not matter which type you use because they are the same thing. Rock salt is simply a coarser version that comes from the mines, which means it may contain more impurities than table salt. Water softener salt, on the other hand, is a more purified variety of salt that does not usually contain iodine like table salt. In regards to solar and evaporated salt, they are simply salt obtained by evaporating seawater. Our Ohio: Can I Use Salt to Kill Weeds? Aquascience Research Group: The Use of Salt in the Freshwater Aquarium or Pond.